From the moment I realized some bodies from September 11th will never be recovered, I have felt a special sympathy for the families and friends. And I have thought about my dad. My dad knows what this means for them. When a group of New York firefighters went to Ground Zero to protest reduction in their numbers working the recovery efforts, I thought maybe I understood, too. “Mayor Guiliani, let us bring our brothers home,” one protest sign read. 250 of 350 firefighters were still missing and presumed dead, and the firefighters wanted to continue their search despite their own exhaustion and grief, despite the tons of debris and months of work left, and despite risks to their own health. They were driven to do this almost as much as they are driven to walk into danger to help the living. Bringing the body home is the last service they can perform for their fellow-firefighter’s family, a family that includes them. In July 1944, the Quinault Victory and the E. A. Bryan, two heavily loaded ammunition ships docked side by side at Port Chicago in San Francisco harbor, blew up. The force of the explosion was nearly that of the atomic bomb that would rip apart Hiroshima a year later. It destroyed a three-mile area and vaporized the ships. Of the 320 men who died, 264 bodies were never recovered. Among them was the body of Woodrow Arthur Riiff, my father’s only brother. 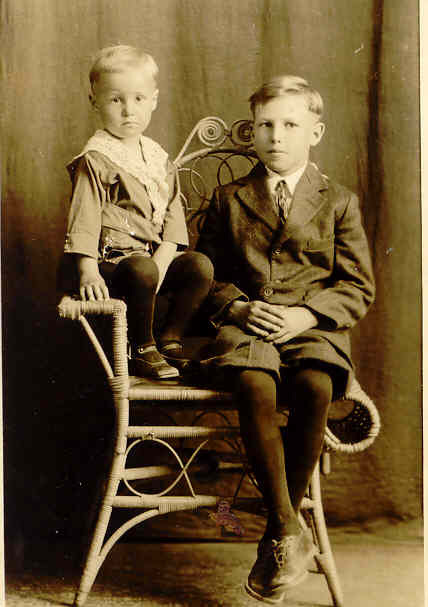 My parents had been married six weeks when the telegram came: Woodrow was missing and presumed dead. When time did not bring home a body, my father had troubles believing it was true. Sometimes don’t miracles happen? Maybe it was all a big mistake. What’s more, he had nagging doubts and worries. What if Woodrow were injured and unable to make his way back to them? What if he had amnesia from the blast? About a year later, driven by a need to know, to comprehend, my parents went to San Francisco and spoke with people who remembered the explosion. They described the water covered in flotsam and jetsam, including hands, feet, boots and hats. The mind and the heart are reluctant to let go. They have tricks of their own, and one of them is to hold on to hope until the body is found. My dad longed for this all to be some terrible mistake, and there was no body to lay his longings to rest, no certainty to help him accept the reality of Woodrow’s death. Long after the headstone had been placed over the empty grave, my father wondered about his brother. The gift of the body is the gift of knowing beyond doubt, knowing for certain, of no longer being in limbo. “Lay to rest” has a double meaning: one for the dead, one for the living. I imagine this is why myths grow up about assimilated POWs living deep in the jungles. It is why, a quarter of a century after Vietnam, the bodies of the Missing In Action are searched for in the difficult terrain of Southeast Asia. Though I was born nearly ten years after Woodrow’s death, I cannot remember a time when I was not aware of that event or that it had been the poignant and defining moment in my family’s history. It had irrevocably and forever changed the lives of my grandparents, Woodrow’s brother and sisters, and his widow and four year old daughter. Families each have stories, and the loss of Woodrow in this way was at the center of ours. I don’t remember exactly how I knew the story of Woodrow’s death–I learned it more from conversations between my aunts and mother than my dad. I never heard him complain, and there was no blaming of the navy or government that I can remember. But somehow over time I came to understand that the unconfirmable loss of his brother was at the core of my dad’s very being. Some things are too deep for words. Some of the demons my dad and others in the family wrestled with in the course of life, I have no doubt, were exacerbated by this event. Yet my dad found ways to go on and live what appears to me to be a very meaningful life, a life as full of joy as it has been of sorrow. The weekend after September 11th, my parents came to celebrate Dad’s 82nd birthday. The television was on, and the young man and woman being interviewed on the street were searching for their brother, distributing fliers with his photograph and asking if anyone had seen him. The stress of their state of uncertainty was very evident. I turned to Dad and asked if the events of September 11th had brought back memories. “The Gift of the Body” by Claudia Riiff Finseth was first published by Dmae Roberts of MediaRites on 1stPerson.org, now known as Stories1st.org; and later in the Tacoma News Tribune.